Considering Facebook advertising? Facebook features a powerful advertising system built on a massive audience (over 2 billion users) that you can use to dramatically expand the reach of your advertising. As powerful as Facebook advertising is, there are many details that make it complex and difficult to get it right. We are experienced, certified and work to ensure your advertising is targeting the right audience, with the right message, to ensure your marketing success. It is important to understand what Facebook advertising is and what it is not. After just a few minutes on Facebook, you are bound to encounter post from your friend, post from businesses you follow, posts from groups you belong to and sponsored posts better know as ads. As a business, it is important to have a presence on Facebook to establish credibility and to serve as another platform to engage and interact with your clients. Creating daily posts, creating events and sharing posts are all important aspects of creating a strong Facebook presence but, they are not Facebook Advertising. Facebook Posts are created on your business page and will display in your timeline of your account. This post will only be shared with people who "like" your page and only about 2% of those people will actually see the post. These posts do not cost anything, though they can be boosted for a few dollars they do not have all of the control and targeting as paid Facebook ads. Above is an example of a paid Facebook Ad. 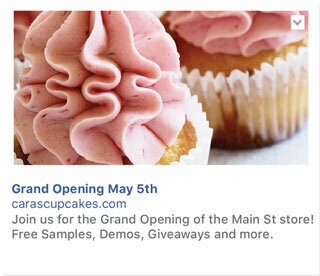 This ad runs in the users newsfeed and can be easily identified as an advertisement by the heading sponsored as circled in the image. These post can be targeted to very specific audiences based on your brand. Above is an example of a paid Facebook Ad. This ad runs in the users sidebar on desktop only. These post can be targeted to very specific audiences based on your brand. Facebook offers businesses a paid advertising platform to reach new customers and engage with current customers. These ads go above and beyond the capabilities of Facebook posts. 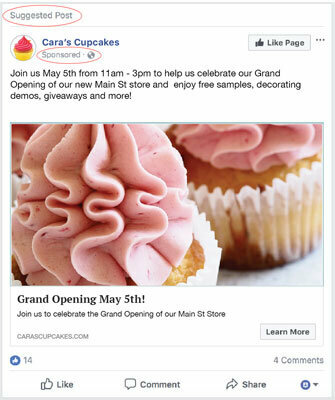 Facebook Ads can appear in News Feed on desktop and mobile, and in the right column of Facebook on the desktop view. 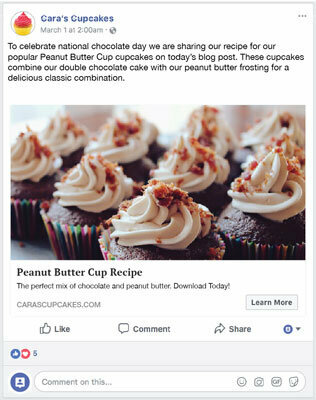 These paid ads on Facebook can be used for a number of campaign objectives. These objectives include Page Likes, Clicks to Websites, Website Conversions, Event Responses, and Offer Claims. Engage your ideal customer where they are already spending their time online. Using a wide variety of targeting options you can put your products and services in front of your ideal client, with engaging ads designed to drive traffic to your website. Pinpoint your ideal customers and engage them with compelling offers or information about your unique business. Lead Generation forms are embedded directly into Facebook so the customer never has to leave the app or webpage, making it convenient and easy to use for the customer. Create a buzz and gain momentum around your product and service offers. Increase your brand awareness and introduce what makes your products and services unique and valuable to new potential and existing clients. Promote your upcoming events by reaching the right people who will attend while also gaining an increase in your brand exposure. Event promotions also help increase brand awareness and are a great way to collect leads. Ad targeting allows you to show your ads to your ideal audience. Targeting can be pinpointed based on location and demographics like age, gender and interest. You can also target your ads based on their behaviors, job titles, income and many other factors. 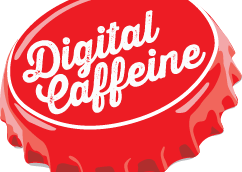 Ad testing is a fundamental part of our campaign creation and strategy. A/B testing, also called split testing, is a method in which we test ad headlines, body copy, images and calls to action against each other. Using this method we are able to continually refine the ads to both better engage your target audience and create trackable conversions. Custom audiences can be built based on your current or ideal clients. From these lists we can create lookalike audiences to expand the reach of your brand and services. These list, along with tracking codes allow us to create remarketing lists. Remarketing lists can be used to target a website visitor who has been to your site but has not converted. Allowing for custom ads to be shown based on their particular behavior and allows us engage them at any point of your sales funnel. We understand you have a business to run so you don’t have time to bother with confusing spreadsheets. The Buzz, Our custom designed dashboard that has all the metrics you really care about available at one glance. You tell us exactly what you care about most and we upload it to a dashboard so you can visually see exactly what’s going on. 24/7– you can see exactly what is going on with all your campaigns. Learn More about our reporting system.